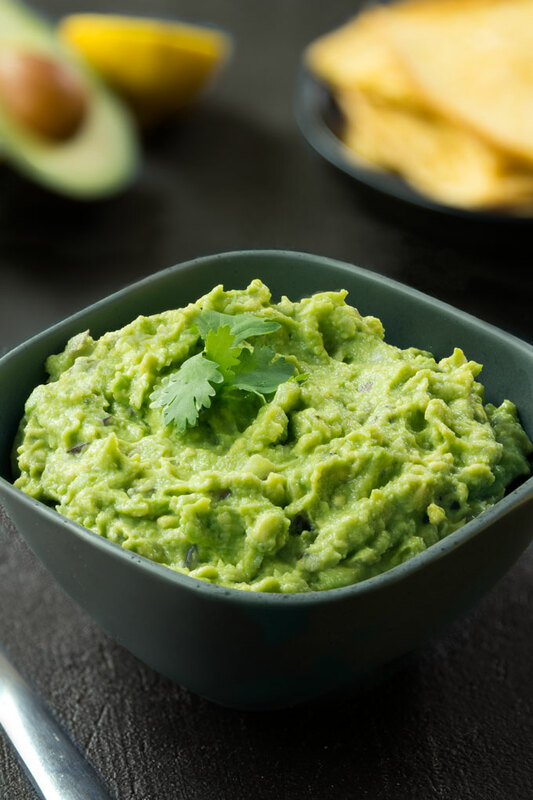 Guacamole is one of those foods that are so simple to make that you don’t even need a recipe. Yet, many people – even experienced cooks – are scared of messing it up. After experimenting with tens of variations over the past 10 years, I’ve found that a few simple ingredients thoroughly mixed together is all it takes to make the best guacamole. Last year, my Mexican friend Maria hosted a Cinco de Mayo party. I was super excited when she handed me an invitation because I knew everything about this party was gonna be authentic. I was curious about the food she was gonna serve, the music that was gonna play, and the overall atmosphere. If you’ve never heard of Cinco de Mayo, it’s a holiday celebrating the victory of the Mexican army over the French army in the battle of Puebla on the 5th of May 1862. As I found out at the party, Cinco de Mayo isn’t a Mexico-wide celebrated holiday. It’s mostly celebrated in regions where the battle took place. So naturally, some Mexicans at the party found it a bit funny that non-Mexicans were celebrating this holiday. One lady from Baja Peninsula, a region on the opposite side of Mexico from where the battle took place, for instance, had never celebrated this holiday before. For her family Cinco de Mayo was just another day with no special plans. I think that the welcoming of different cultures and traditions is one of the things that make North America unique. There are so many people from different countries and backgrounds. They bring along their cultural celebrations, music, art at local festivals, cultural foods … hmm, cultural foods. I love sampling food from different cultures so I was excited about all the appetizers Maria prepared – homemade corn chips, salsa, guacamole, refried beans, tamales, and chile rellenos. Since avocados are the main ingredient in guacamole, the most important thing is to start with excellent, high-quality avocados. Here are a few variables to consider when shopping for avocados. Variety – fresh avocados come in a variety of sizes, types and varietals. Hass avocados are the most popular option, due to their buttery taste and smooth texture. Ripe avocados yield to firm gentle pressure and are best for immediate use. If you need your ripe avocados to last a bit longer, place them in the fridge to slow the ripening process. Unripe avocados feel firm and don’t yield to gentle pressure. You can purchase them 4-5 days before you’re ready to use them. If the avocados don’t ripen in time, place them in a brown paper bag. A brown paper bag concentrates a gas called ethylene, which causes fast ripening. The higher the concentration of ethylene, the faster your fruit ripens. Overripe avocados feel mushy or very soft to the touch and aren’t suitable for guacamole. Brown spots and striations – sometimes an avocado “feels” perfectly ripe to the touch, but when you cut it open, you discover brown spots and striations instead of a creamy, luscious green interior. To ensure you’re buying a perfectly green avocado on the inside, peel back the small stem or cap at the top of the avocado. If the cap comes away easily and you find green underneath, you’ve got a good avocado that’s ripe. You can use it immediately. If the stem doesn’t come off, the avocado isn’t yet ripe enough. Let it ripen for a few more days. If you pull back the stem and find brown underneath, the avocado is overripe, and you’re likely to find brown spots inside the fruit. Toss it out. Ask an American and a Mexican whether you should add lime juice to your guacamole, and you’ll likely get two different answers. 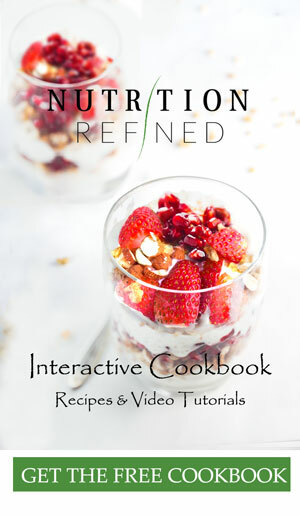 Looking through cookbooks from Mexican cooking authorities, I found a common theme. Dianna Kennedy all but forbids adding lime in the Art of Mexican Cooking by saying that “it spoils the balance of flavors”. In Guadalupe Rivera’s book Frida’s Fiestas, Guadalupe gives her guacamole a punch with chipotle chiles, not citrus. And Hugo Ortega in his Street Foods of Mexico writes that “the secret to a good guacamole is to respect the avocado flavor and not drown it in lime juice”. So can you add lime? I say “YES!” In fact, I can’t imagine my guacamole without a generous splash of lime. The citric acid provides a nice citrus flavor, making the guacamole taste fresh and bright. I like to add enough to cut through the richness of the avocado flesh, but not so much that you taste the lime’s tartness. If you like onions, you’ll love the flavor and crunchy yet succulent texture it gives to guacamole. Just be sure to chop it finely so it doesn’t overpower the other ingredients. Another ingredient that can improve any guacamole is fresh cilantro. Cilantro adds a distinct flavor and a slight crunch. However, exercise caution before adding it in. Some people don’t like cilantro so consider your audience first. Perhaps trivial to mention, but a generous sprinkle of salt is crucial to cut through the fatty avocado layer, which coats your tongue and can mute any other flavors. So don’t be stingy with the salt. It’s amazing what another pinch can do to bring out guacamole’s best. Slice the avocado while it’s still in its shell and then gently scoop the slices out with a spoon. Run a thin metal spoon between the flesh and skin of an avocado half to loosen it. Then pop the intact avocado half out, and from there cut it into your desired shape. 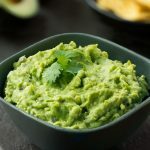 Recipes vary on whether the avocados should be sliced, diced, mashed, or pureed depending on the desired level of “smooth” or “chunky” guacamole. For a smooth guacamole, a food processor works wonders. 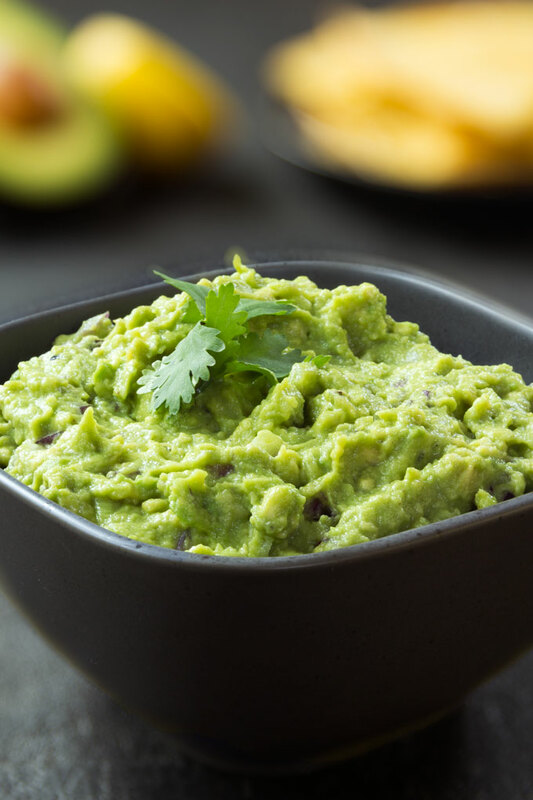 If you like your guacamole more like a dip, you can add the rest of the ingredients into the food processor as well and puree everything together. For a chunkier guacamole, I find that a simple fork or a potato masher work the best. 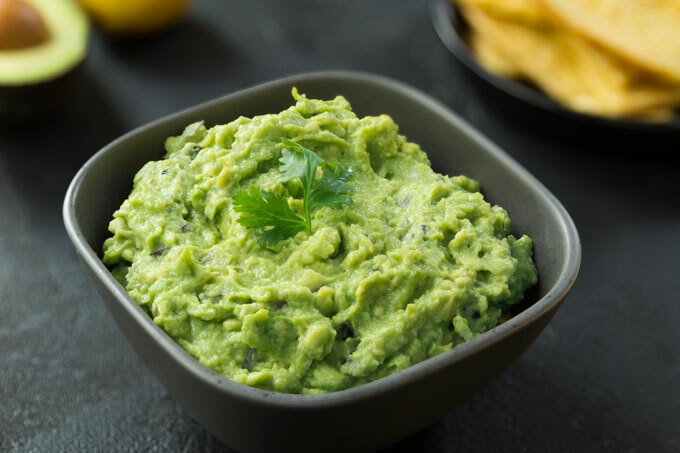 Once you’ve got your avocado mashed, you’ll have to work relatively fast because an enzyme in avocados causes the flesh to oxidize when exposed to air, turning it an unappealing brown color. If you’re going for a smooth guacamole, you don’t have to worry about this step. However, if you’re just mashing your avocados, you’l need to process the aromatics in a similar fashion. The problem with aromatics is that they pack their flavor inside their cells. As J. Kenji Lopez-Alt from Serious Eats writes, “in order to access that flavor, you’ve got to break down cell walls either by cooking, grinding, or chewing”. So if you have the time, don’t just chop the cilantro, onions, chiles, or any other aromatics you’re adding. Use a mortar and pestle to mash those aromatics into a paste before adding them to the mashed avocados. If you’ve ever stored leftover avocado in the fridge, you’ve probably noticed that the cut surface of an avocado quickly turns brown. To keep your avocados (and guacamole) fresh and tasty, you need to prevent it from coming into contact with oxygen. While there are several techniques people use , I found that only one of them truly works. Pressing a piece of plastic wrap over a bowl of guacamole seldom creates a tight enough seal to keep the air out. Squeezing a bit of lime juice on top of an already made guacamole isn’t a good idea either. After adding enough acid to slow the browning down, your guacamole will be incredibly sour. Covering the guacamole with water and then pouring it out makes the guacamole slimy and dilutes the guacamole’s flavor. Scattering some of the chopped onion called for in the recipe on top of the guacamole works the best. As Dana Velden from the Kitchn writes, the reason this works might be the sulfur compounds that the onion releases. Mix the onion into the guacamole right before serving. Authentic guacamole that simple, quick, flavorful, and makes for a perfect Mexican side dish. Store leftover gucamole in an airtight container in the refrigerator for 2-3 days, though best when fresh. *If you're not going to be serving the guacamole right away, save the onion for later. (Do not process the onion with the other ingredients). Once the guacamole is ready, transfer it into an air-tight container and scatter the chopped onion on top. Seal the container with a lid, and put it in the fridge. Mix the onion into the guacamole right before serving.